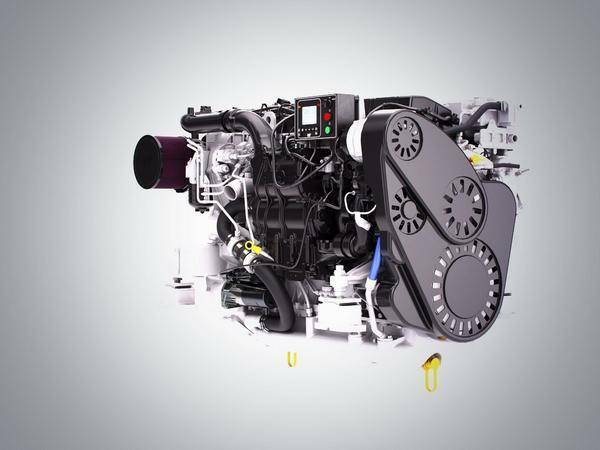 Caterpillar Marine announced the availability of the Cat C8.7 supercharged diesel engine capable of delivering 650 MHP at 2,300 RPM while meeting EPA Tier 3, IMO 2, EU Stage IIIA and RCD emissions requirements. In addition to internal validation activities, the electronically-controlled C8.7 recently completed field testing on three sportfish yachts, ranging from 48-55 feet, accumulating over 7,500 hours. Customers can order the C8.7 from the global Cat dealer network. The C8.7’s fuel delivery system allows the use of a radial, belt driven supercharger in addition to a conventional turbocharger. Caterpillar said this feature eliminates smoke and reduces lugging, while delivering phenomenal low-end torque and impressive fuel economy. Once the supercharger is no longer needed as the turbo takes over the boost function, an electromagnetic clutch disengages the supercharger to avoid becoming a parasitic load and allows the turbo to provide the maximum permissible boost pressure. According to the manufacturer, this renders the new engine impervious to turbocharger lag and allows rapid transient response throughout the engine’s operating range. Maintenance and operation of the C8.7 is also simple thanks to left and right hand service options and an electric fuel priming pump to minimize both downtime and effort. Along with traditional shaftline installations, the C8.7 is also designed to be integrated with the Cat Three60 Pod 650 available in fall 2015. The C8.7 can also be used with Caterpillar’s Three60 Precision Control maneuvering system.